Round 3 of ATC found my team once again picking tables, and so I landed with the Circle mirror after our last two people on both teams were mercs and circle and both merc players wanted to not play into Circle. My opponent, a gentleman named Russel with a fantastic beard, had Krueger 2 bones and Iona in Dev Host. I did not expect to see Iona, since I had a Storm Raptor in my pairing, so I dropped Grayle since I really did not want to play that Krueger 2 list ever again. Russel picked Krueger 2 (which made sense because we were playing Mirage), won the roll off, and then spent a few minutes agonizing about whether to go first or second. If he goes first, I get to score first (bad!) but if he goes second, he has to play around LotF assassination all game (also bad!). 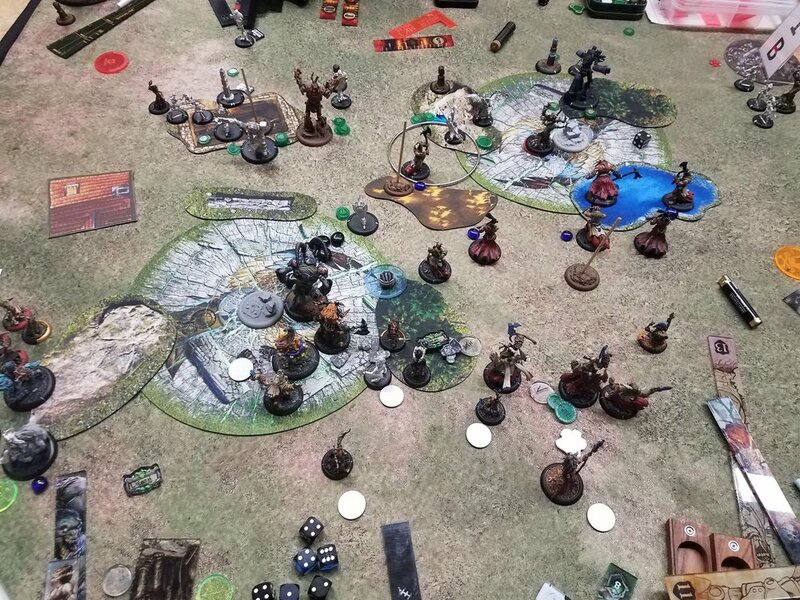 Ultimately he decided to go first, and I took the side with a nicely placed wall at the edge of my zone, ambushing my Bloodweavers and putting Prey on Megalith with Brighid and Caul. Everything runs at me, although Lord of the Feast has an 11” bubble of nope around him, so stuff stays a little farther back than it regularly would. Windstorm goes up (or else that bubble of nope would be 16”) and things position for the next turn. Time to be fearless. Storm Rager goes up on Lord of the Feast after Harmonious on Grayle. The Ravagers run up, staying out of aim range of the Sentry Mannekins. It’s hard to only trigger vengeance on one unit here. My battlegroup hangs out on the left since they’re the best suited to tangling with the Fulcrum out of the models in my list. The Boilmaster fills up Lord of the Feast, so he’s now 14/21 stealth against shooting which feels pretty good. 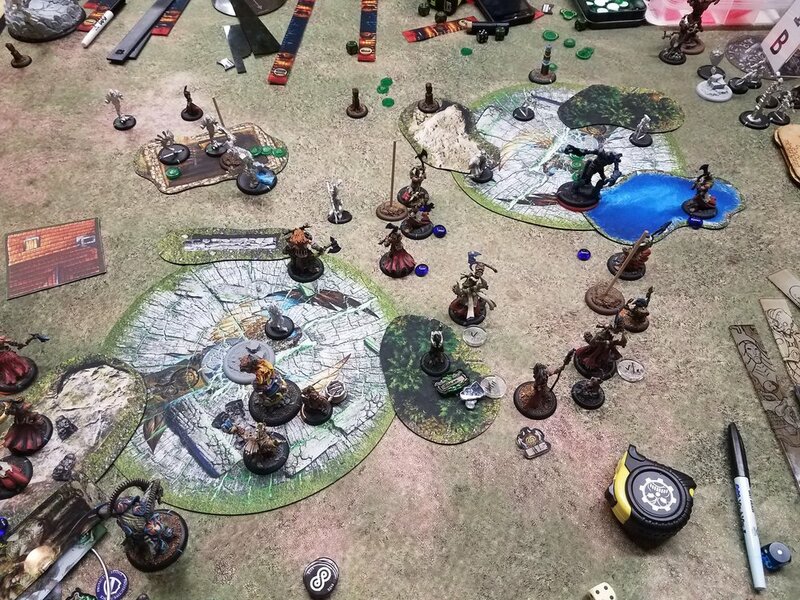 The Fulcrum and Krueger clear all the fury on the table, and Krueger kicks things off by arcing a Rebuke through a placed Gallows Groves into one of my Ravager units. Wyrd shots and Sentry Stones cull the ranks by a couple, triggering Vengeance. The Celestial Fulcrum scoots up and lands a crit Freeze on Lord of the Feast, but only does one damage. The Fireball does nothing, and the Electro Leap misses. It gets Telekinesised backwards two inches. Sentry Stones on the left look suspiciously close to the side of the table to my ambushing Bloodweaver eyes. I do a couple of quick measurements before doing anything else. Critically, Ghetorix is within 14 inches of the Fulcrum and the Sentry Stone on the left is well within 13 inches of the table edge. Naturally, the Weavers ambush on that side of the board, and my Ravagers vengeance. Grayle gets Harmonious from the Blood Shaman and puts down a Windblast on the cloud and on top of the Wyrd. He also Feats. The Nightwitch dispels the Ravagers by killing one (awww), and then the Gallows Grove gets obliterated, moving Ghetorix forward with the feat. Ghetorix charges and kills the Fulcrum handily. Ravagers charge in and fail to kill a Wyrd with three of them, do some damage to the objective, and land a solid hit on a Warden. The Ambushing Bloodweavers kill a Shifting Stone and leave the Sentry Stone on two boxes. The hero Gobber Chef runs up to score my flag, and the score becomes 2 - 0 in my favor. The response is fairly brutal. Russel ports his remaining Gallows Grove up to prevent five Tharn from healing or making tough checks. Krueger charges in and kills a couple and then Feats to shove everything around. He also re-applies Rebuke. His left hand Woldwarden Telekinesised Ghetorix around and killed the contesting Wolf Rider Champion. One Stoneshaper lands a spray on 4 of 6 Bloodweavers and kills all of them. Another dies to Sentry Stone Mannikins and the sixth survives and is engaged. Fortunately, I’ve killed his Shifting Stone’s ability to teleport so he has to choose between giving Megalith +2 Strength and running his other Stoneshaper to the flag. He opts to make Megalith more likely to kill Ghetorix, which he does very handily. 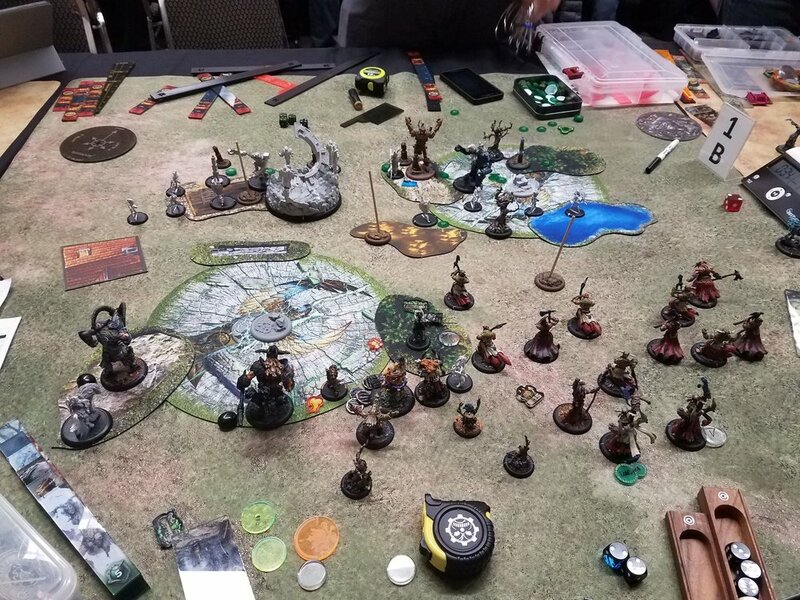 The other Woldwarden tramples into the back of his zone to kill the Wolf Rider champion, and finally the crippled Woldwyrd takes a freestrike to run into my zone. My Ravager is now out of command and cannot make a free strike, so the little guy continues to survive. Russel scores 1, bringing the score 1 - 2. Even under Krueger’s feat, I can get a bit done. Lord of the Feast is finally unfrozen, but he’s speed 4 and Windstorm is up again. Ravagers Vengeance, have Rebuke removed by the Blood Witch, and destroy the objective and the contesting Wyrd. The Shadowhorn walks and jumps up to Megalith and chucks him back towards me. Brighid and Caul, now in range of their prey target, make quick work of the unfortunate construct. Prey swaps to the near Woldwarden. The Hero Bloodweaver survives a freestrike on her way to charge the Sentry Stone on the left and murders it! The Gobber Chef saunters back up to his flag, and I score a total of three points this turn. Russel kills off the Shadowhorn and clears his zone. What neither of us had realized up until this point is that he had about 1.5 minutes of clock left at the start of his turn, and he clocks out in the middle of a Krueger activation that saw him charge and kill Brighid and a Ravager. This matchup felt very comfortable for my list. The Krueger variant that does not play a Bog Trog Mistspeaker never threatens Grayle directly enough to make him play incredibly defensively. 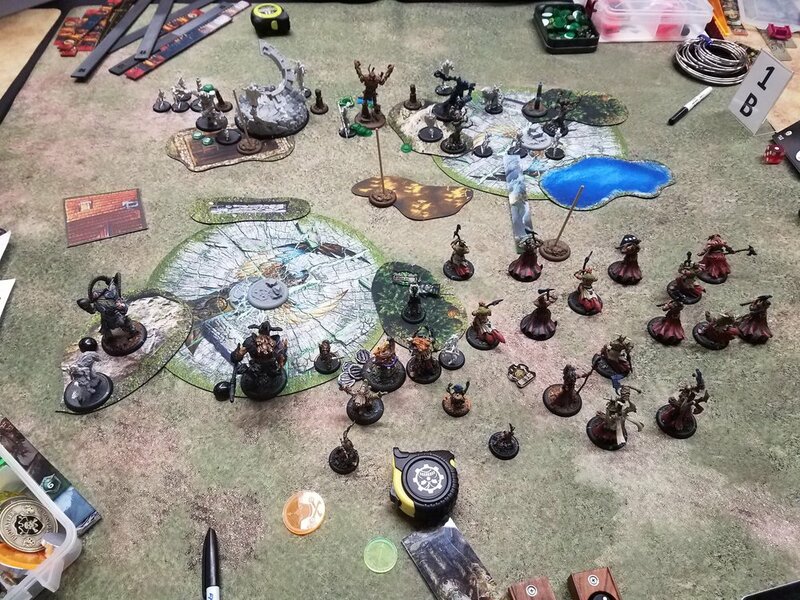 Lord of the Feast has some serious game into any of his heavies or the Fulcrum with Storm Rager and Divine Inspiration stacked up, and even though he spent the entire game hiding in the forest, he still heavily dictated positioning which was awesome. Russel was a fantastic opponent, a real pleasure to play against, and the rest of his team was similarly amiable. We ended up winning the round 4 - 1, solidly picking our morale back up after the fiasco that was round 2. Stick around for round 4, coming soon!